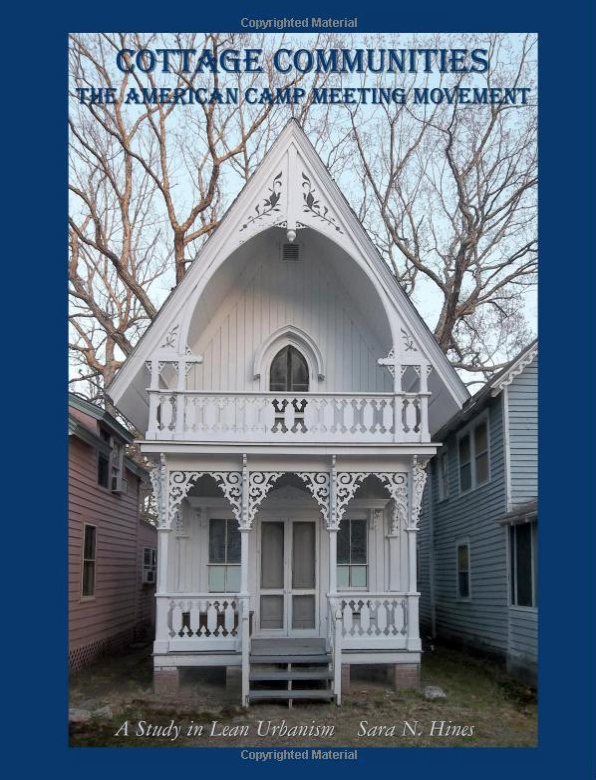 In honor of Mount Tabor’s 150th Anniversary year, the Historical Society has invited author Sara Hines for a special presentation based on her book “Cottage Communities – The American Camp Meeting Movement: a Study in Lean Urbanism”. Sara N. Hines is an architect, urban designer, and photographer. She has practiced and taught architecture for many years and is now based in Massachusetts, where she continues to practice and research Camp Meetings and work for their preservation. Cottage Communities is a study of the American Camp Meeting Movement, from 1786-present, showing how the planning, land use, governance, architecture and detailing created these unique places where a strong experience of community is clear even today. There are still approximately 1000 Camp Meeting Grounds left from a high point of over 3000 locations. Camp Meetings are about vernacular or historic design, as well as a resource for those interested in urban design, ingenuity in structure and use of materials, and building detailing. As part of the discussion on Lean Urbanism, these places are source information on small or tiny houses, cottage design, pocket neighborhoods, affordable housing and self-building for lean, efficient living. Design and site planning to generate community through an intuitive understanding of spaces, distances and how it all works is also discussed. The observations on how behavior is affected by built space reflects knowledge achieved over time. The beauty of the buildings and design concepts that are cutting-edge even by today’s standards, are shown in many color photographs, maps, and drawings. The history of the movement is recounted to show the evolution of Camp Meetings alongside the evolution of the United States as the movement started just after the Revolution. Today’s concepts of land trust communities, resorts, condominiums, trailer parks, co-housing, even town design owe much to the communities designs as Camp Meetings. The book is a rich collection of vernacular construction techniques, ideas that support tiny houses, movable houses, and self-build found here. Simple and lean lifestyle and design is shown in Camp Meeting Communities from over 50 Camp Grounds from Maine to Mississippi and Colorado. The book is a good resource for architects, planners and designers, but it also provides an overview of the subject appropriate to anyone interested in Camp Meetings.